Saturday, April 16 at 5 p.m. Kick off spring the right way with a celebration of Rose at Waterbrook! We ll have Roses from over 10 different wineries, a multi-winemaker dinner, live music, and more. Don t miss this opportunity to mingle with the winemakers, enjoy the sun, and drink pink! 5 7 p.m.: Tastings, appetizers on the patio and winemakers discussing their wines. 7 p.m.: Informal buffet dinner meant for grazing, chatting and drinking. RSVP by April 13 to Michelle Monda at michellem@waterbrook.com. Saturday, March 26, 3 p.m. to 7 p.m. Pop bottles and celebrate the start of Spring Break in style with Gruet! Experience exclusive tastings with our winemakers, tank and barrel samples for a sneak peek of our new and upcoming releases plus live music, a food truck and more. You won t want to miss out on any of the fun or good vibes! Your ticket includes your first glass of bubbly and exclusive tastings. RSVP's are appreciated and can be sent to Regina at regina@gruetwinery.com or 505.821.0055. Saturday, February 13, 6 p.m. to 8:30 p.m.
Join us for arts, hearts and, of course, bubbly at our Valentine's Paint & Sip Night! Bring your Valentine or simply your creative self for a fun and fabulous evening creating a double canvas collaborative painting lead by the locally-based Sisters Paint and Wine. Delicious assorted chocolates and Gruet sparkling wine will be served at this fun and indulgent event. Reservation includes your first glass of bubbly. Gruet Winery's monthly Mimosa Bar is back! Starting up just in time for Valentine's Day, enjoy our seasonal mimosa menu and other sparkling wine cocktails with your sweetheart or your best friends. Sunday, February 14, 6:30 p.m.-9 p.m. Spend Valentine's Day discovering the true you with Gruet and Spiritual Relationship Coach, Angie Corbett. Find out the tools it takes to love yourself fully and in turn attract the life and love you deserve. Ticket includes your first glass of bubbly and light appetizers. Join Gruet Winery in the inaugural year of Heritage Productions LLC's Santa Fe Foodie Classic! The kickoff of the Foodie Classic is a decadent dinner that will be a feast for all the senses with dramatic design and stimulating music. 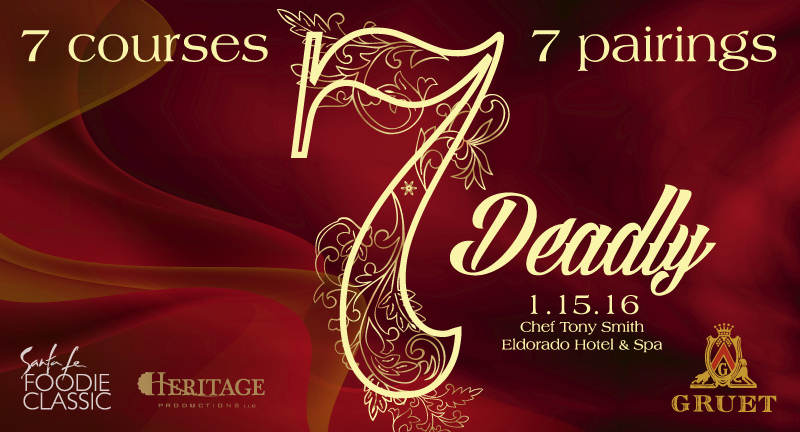 Hosted at the historic Eldorado Hotel & Spa, guests will be treated to seven gourmet courses by Executive Chef Tony Smith with seven complementary wine pairings selected by our own renownedwinemaker, Laurent Gruet. For more information about ticketing for the dinner, a meet the winemaker session with Laurent, or the grand tasting check out the Santa Fe Foodie Classic's website: www.santafefoodieclassic.com. Check off your holiday gift list at Gruet! Create your own gift package with our selection of sparkling wines or select from our premade assortment. All weekend enjoy specials holiday pricing and guaranteed delivery in time for Christmas! Want to beat the rush? Join us for a VIP session before the tasting room opens on December 5 from 10 a.m. to noon. Sip on mimosas and snack on light breakfast treats while you get a first look at our holiday assortment! 8400 Pan American Fwy N.E. December 11, 5 7 p.m.
Bring a guest and join us for a festive evening full of your favorite Gruet wines and light hors d oeuvres! Help us celebrate the launch of our new packaging while you pick up your latest wine club selections, including the 2013 Pinot Noir. Each grape cluster for our 2013 Pinot Noir was handpicked from our vineyards. The grapes are then destemmed and pushed down by hand for 14 days. Our 2013 Pinot Noir marries the richness of the new world and the delicateness of the old world. It leads with nice oak aroma full of black cherry and cassis. Black cherry continues on the palate and mixes withblack currants and a touch of smokiness on the finish. Reservations appreciated. Contact Gina at 505.821.0055 or gina@gruetwinery.com with questions.